He always wanted to be special ... but he never expected this! Scott Howard thought he was an ordinary teenager. But he soon realized, he's anything but average. The high school basketball player has noticed his body going through pretty odd physical changes. Growing excessive hair on his hands, ears and back has made Scott a little nervous. But rather than fight these werewolf tendencies he's gonna make the most of them. Who knows, they might just make life at school a little easier. When Back to the Future became the biggest hit of 1985, Michael J. Fox leapt to the level of “A”-list actor and got to ponder what his follow-up film would be. Despite his new super-stardom, Fox continued his role on TV’s Family Ties and wouldn’t perform in a post-Future movie until 1987. The public perception of Fox’s career differs, though, as he starred in a big-screen release less than two months after Future hit. Teen Wolf came out toward the end of summer 1985 and seemed to represent Fox’s follow-up to Future. Nope. Fox actually shot Wolf before he acted in Future; it simply didn’t make it to screens first. It’s unclear what fate Wolf would’ve endured without the success of Future; it might’ve stayed unreleased theatrically or just been dumped to cable. But with Fox the new It Boy, Wolf got rushed onto screens and earned decent bucks. Fox probably wasn’t too wild to have it perceived as his follow-up to Future, but them’s the breaks! I could understand any potential reluctance on Fox’s part, as Teen Wolf offers pretty banal 80s teen comedy. 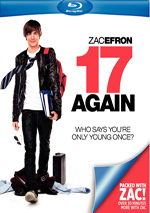 High school student Scott Howard (Fox) finds himself going through changes. He growls at basketball opponents, can hear dog whistles, and discovers odd hair growth across his body. It turns out that Scott has werewolf in him, and this emerges as he matures. Scott freaks out about this at first – duh! – but learns to embrace his lupine side. He becomes a superstar basketball player and the most popular kid in school. Scott lets this go to his head, so while he bags the girl of his dreams (Lorie Griffin), he also threatens to lose sight of who he really is, as “The Wolf” takes over. As I watched Wolf, I tried to put myself back into the 1985 mindset and appreciate it for what it was in that era. I couldn’t do it – or I couldn’t do it enough to figure out what made this movie a minor hit back then. Heck, I’m amazed that Wolf didn’t undo all the good will Future engendered for Fox. Something this bad should’ve been a career killer, but I guess Fox was Teflon for a while there; if a dud like Wolf couldn’t derail his trajectory, I don’t know what could. Essentially a more comedic riff on 1957’s I Was a Teenage Werewolf, this one could’ve been decent at the very least. Though the theme isn’t particularly original or exciting, it boasted enough potential to make it fun. How could a movie about a teen werewolf be so thoroughly dull and forgettable? I don’t know, but Wolf fails in most possible ways. Back in his day, Fox boasted ample charisma, but he looks bored here. He essentially plays the part on cruise control and appears to want to distance himself from the awful script. Other cast members try harder, but they don’t do any better. Scott’s buddy Stiles (Jerry Levine) may be the most obnoxious personality of 80s teen movies, and you won’t find a more self-conscious attempt of an attempt to create a break-out character; he exists just for catchphrases and wackiness, and he always feels phony and annoying. The love triangle among Scott, blonde babe Pamela (Griffin) and Scott’s lifelong pal Boof (Susan Ursitti) fails to ignite any sparks, largely because it’s so transparent and predictable. Is there ever any doubt who’ll win? No, and these scenes are just there to occupy space. Actually, the whole movie feels like filler. We get about 10 minutes of plot and 80 minutes of musical montages and “party hearty” hijinks – or at least that’s how it feels. Outside of some predictable plot developments, not much happens here; how a movie about a teenage werewolf could be so uneventful befuddles me. I also can’t figure out how a 90-minute movie can seem longer than an uncut version of War and Peace, but Teen Wolf manages to make time stand still. If Michael J. Fox never became a mega-star for Back to the Future, Teen Wolf wouldn’t have found any kind of audience. And that would’ve been the fate this stale flick deserved. 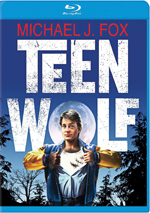 Teen Wolf appears in an aspect ratio of approximately 1.85:1 on this Blu-Ray Disc. This was an inconsistent transfer. One concern related to sharpness. While most of the movie provided acceptable to good clarity, more than a few exceptions occurred, especially during interiors; those tended to be somewhat fuzzy. The majority of the flick provided fairly nice definition, though. No issues with jagged edges or shimmering occurred, and the image lacked edge haloes. Unfortunately, the movie suffered from a moderate level of print flaws. I noticed various isntances of specks, marks and debris throughout the film. These varied in intensity but cropped up pretty consistently. Colors were also erratic. 1980s flicks tend toward runny hues, and that was an issue here, as tones were often fairly heavy. They weren’t bad, but they lacked vivacity and seemed generally thick. Blacks seemed okay, with decent depth, but they weren’t better than average. Shadows showed the same issues; low-light shots tended to appear somewhat muddy. This wasn’t a poor image but it had too many problems for a grade above a “C-“. At least I felt happier about the monaural soundtrack of Teen Wolf. Audio quality was surprisingly good, especially in terms of music; the synth score didn’t have great highs, but they were fine, and the music was pretty deep and full. Speech showed good clarity. Lines lacked edginess and were reasonably natural; like the misic, they occasionally seemed a bit dull, but they were pretty positive. Effects didn’t have much to do, but they were fine; they showed decent to good range and definition. Nothing here really excelled, but the track was a bit above average for its age. In addition to the film’s trailer, the disc includes a preview for an MTV series based on the movie. Well, sort of – it takes a teen werewolf and gives him the same name/basic set-up, but it clearly opts for much more of a horror vibe than the 1985 flick. Even the presence of Michael J. Fox in his prime can’t redeem the lifeless Teen Wolf. It’s almost a parody of bad 80s teen comedies, as it embraces every cliché and never boasts any cleverness, amusement or fun. The Blu-ray provides mediocre/flawed visuals and lacks substantial supplements, but it comes with a pretty decent soundtrack. Neither the movie nor the Blu-ray impress.